Empress Effects Vintage Modified Superdelay Review - Best Digital Delay? Empress Effects Vintage Modified Superdelay Review – Best Digital Delay? The Empress Effects Superdelay has gained a cult following over the past few years. It packs several features that separate it from other digital delay pedals, and it has an unmistakeable sound and feel that no other pedal can emulate. It’s also known for a surprising amount of warmth and classic mojo, missing from many lesser digital delay pedals. But not resting on their laurels, Empress Effects made a few subtle tweaks to the Superdelay’s popular Tape Mode to create the Vintage Modified Superdelay. The result, we hope, is an even more “super” Superdelay, perhaps a candidate for the best digital delay pedal around. The Vintage Modified Superdelay packs in 8 operating modes, up to 2.8 seconds of delay time, 8 presets, a 105dB signal to noise ratio, and a few other surprises. The pedal’s intuitive surface controls also eliminate the need for complicated sub-menus. Here’s a rundown of the pedal’s features before digging into our Empress Effects Vintage Modified Superdelay review. Killer Sound Quality – The Signal to Noise ratio is around 105dB. 2.8 Seconds of Delay Time – For your extra long delays. 8 modes – normal, tap, autoset (delay time is set by tempo played), reverse, rhythm mode (multitap), tape mode, misc (dynamic, gate), and 11 second looper. Expression Pedal Input – allows you to control either mix or feedback with your foot. High Pass/Low Pass Filter – high pass is good for electronic music, low pass is sweet for darker analog delay type sounds. Fast/Slow Modulation – slow adds extra texture, fast is a little crazy. 8 Presets – Settings can be saved to 8 presets. With three stompswitches, accessing the presets is easy. Tap Tempo with Ratios – many of the modes use tap tempo, and the ratio selection makes fast in-time delay times easy. True Bypass – The Empress Superdelay employs true bypass, so you can be sure that it’s not affecting the signal when disengaged. The Empress Superdelay does not run off of batteries. It comes with a power supply. The Empress Superdelay requires 300mA, positive tip, 9 to 12 VDC. You can power the Empress Superdelay from outputs 5 or 6 of the Voodoo Lab Pedal Power 2+. You’ll need to use the red or white reverse polarity connector. You must set the corresponding DIP switch away from the NORMAL position. Also, since the Superdelay requires nearly 300mA, you should only use the other output for a much lower current pedal. 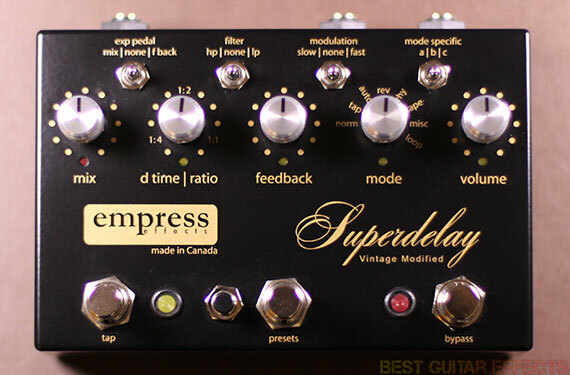 Visit Empress Effects for more info about the Vintage Modified Superdelay. From the moment I plugged in this pedal I absolutely loved it. Sometimes you know something is going to be good, but even so, it isn’t until you experience it firsthand that you understand just how good it is. Aside from the many unique features that set this pedal apart from so many others out there (more on that in a moment), it’s the sound and feel of the delays on offer that really make the Vintage Modified Superdelay something special. I highly recommend that if you have an opportunity, try the Vintage Modified Superdelay and listen to the subtleties in tone that make this such a standout delay pedal. Start with Norm mode and then jump to Tape mode to hear for yourself some great examples of the amazing tones on offer. And with that, I’m going to give a few brief impressions of each of the pedal’s 8 modes. 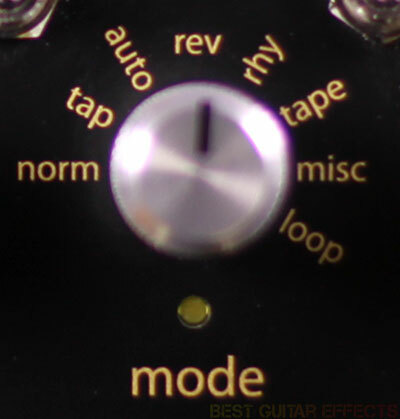 Norm Mode is essentially the standard digital delay mode of the pedal. It’s pure and clear, setting the stage for what’s to come. The A, B, and C functions provide ranges of delay time from as little as 5.5ms up to 2.2 seconds of delay. Try using Mode A with super low Delay Time settings for doubling. Then add in some Slow Modulation for a pristine digital chorus effect. Norm mode offers a prime example of the famous pure Superdelay tone that may be enough to sell this pedal without diving in any further. Of course, not venturing further would really be missing out on the incredible depth this pedal offers. Tap Mode adds some precision to your delays by allowing you to tap in your delay timing via the dedicated Tap footswitch. I particularly like that the D Time / Ratio knob lets you choose from 1:1, 1:2, and 1:4 tap ratios for letting the pedal adapt to your preferred tap ratio. For example, if you like to have straight repeats fall exactly on your taps, leave the Ratio set to 1:1. If you want your delays twice as fast, set the knob to 1:2. The 3 Sub-Modes let you choose between Normal Tap, Triplet Tap, and Dotted Tap options. The Ratio can be used in conjunction with the various tap settings finding your ideal delay rhythms. Auto-Set Mode works surprisingly well for creating delays that are timed with your playing. The Tap light blinks with the dynamics of your playing, triggered by the transient of your initial pick attack. The 3 Sub-Modes allow you to set the sensitivity to volume peaks in your playing. Modes B and C typically work well for tight, rhythmic staccato playing. You can also press the Tap footswitch to change the delay time to the interval of the last two blinks of the Tap light. The Auto-Set Mode offers unique rhythmic possibilities for changing the tempo of your delay in realtime through carefully timed note intervals and a single step on the Tap footswitch. Reverse Mode is the Empress Effects interpretation of the classic reverse delay effects which guitarists have long used to channel Hendrix-like backwards guitar effects. Sub-Mode A lets you use the Tap footswitch to run your guitar signal into the delay at will, adding reverse effects to certain passages only and letting the trails bleed over your dry signal. Sub-Mode B lets you use the Tap footswitch for Tap Tempo while the Ratio provides the familiar 1:1, 1:2, and 1:4 ratio options. Double Time Reverse is one of my favorite modes of this pedal, producing awesome octave up delay effects which can get quite extreme when applying a generous dose of Feedback to the equation. The sounds are pristine and evoke a vibe reminiscent of certain famous pitch-shifting delay effects. The Tap Tempo and Ratio functions are available for adding some rhythmic order to the chaotic crystalline delays. Also, definitely try controlling the Feedback with an expression pedal. Super fun! Rhythm (Multi-Tap) Mode is another of my favorite features of the Vintage Modified Superdelay, giving you 4 taps you can manually program by hitting the Tap footswitch 4 times to create your desired rhythmic spacing. This mode is ideal for creating some great rhythmic presets. Program 4 straight repeats in a row and add some Modulation and Feedback for a great multi-head tape echo effect. The options are limitless. Sub-Mode A lets you vary the Ratio while Sub-Mode B lets you scale your pattern with the Ratio knob to extend or compress the repeats. Sub-Mode C retains the ratio control with Dynamic Volume repeats that increase in volume throughout the 4 tap progression. Tape Mode is probably the biggest draw of the Vintage Modified Superdelay for most guitarists. Sub-Mode A gives you a standard tape echo emulation that’s warm and inviting, offering plenty of inspiration with its classic sounding tones. Adding some Modulation makes it even more lush. It’s also worth experimenting with the High Pass and Low Pass Filters for either slightly metallic tape echo tones or an even deeper analog warmth, whatever your preference may be. Sub-Modes B and C are where this pedal gets its namesake as these two modes were specially tweaked for the Vintage Modified Superdelay to provide even more old-school tape echo flavor. Sub-Mode B brings in some Wow & Flutter for a thicker chorusing sound while Sub-Mode C takes everything further for a rich delay sound that’s saturated and massive, one of the must-play modes of this pedal. If you love quality tape echo emulations and appreciate the versatility of the range of offerings available herein, the Vintage Modified Superdelay will likely be your next must-have delay pedal. Misc Mode offers a few tasty delay variations. Sub-Mode A will increase the Feedback to the level set with the knob as you reduce the volume of your playing. This is great for playing a sequence of notes with single repeats and then letting the last note(s) feedback longer in a cascading trail of delay. Sub-Mode B increases the Mix as your playing volume decreases. This is essentially a dynamic delay and one of the easiest to use and most effective that I’ve ever played. It is not to be overlooked. Sub-Mode C (Tap Mute: Soft Bypass with Trails) gives you a convenient way to add delay spillover when bypassed the delay by using the Tap footswitch to let your signal enter and bypass the delay processor. You could add delay to a single section, let it fade naturally, bring in the delay again, then cut it off abruptly if desired with the True Bypass footswitch. This is incredibly convenient for guitarists who really appreciate the option of spillover or full bypassing of the delay at a moments notice, perhaps within the same song. Looper Mode provides a fun way to record and overdub ideas, useful for improvising creating new song parts. While its not quite as fleshed out as a dedicated looper pedal or even some other delay/looper hybrids, it’s still a welcome addition for a little sound-on-sound recording experimentation. As I mentioned briefly in the Tape Mode comments, the High Pass and Low Pass Filters are quite useful for shaping the tone of the pedal. You can instantly get a darker, more analog sounding delay in any mode with the Low Pass Filter. If you want to keep your low-end from getting too muddy in a busy mix, engage the High Pass Filter for more high-end focused delays over the rest of the mix. The Modulation settings add some movement if you feel that dry delays are a little bland with the preset Slow and Fast variations being well-suited to adding some life to the delay tones. An expression pedal can be added to control the Mix or Feedback in realtime. This gives you a couple options for adding and removing delay or adding some runaway delay oscillation to the more avant-garde sections of your performances. The Vintage Modified Superdelay packs in plenty of delay possibilities, including many that are entirely unique to this pedal. It’s without a doubt one of the most powerful and versatile delay pedals available. If I had to nitpick or seek faults, perhaps some guitarists would like expression pedal control over the delay time as well. More presets would be nice although 8 will be plenty for most guitarists. Remember, we’re not scrolling through sub-menus here which is part of what makes this pedal so simple to use despite its complex possibilities. Personally, I would love it if this pedal had MIDI implementation as I appreciate the extra control it offers when using guitar pedals with effects switchers or DAW’s like Ableton Live. Since it’s a digital delay, I could imagine that such a variation is possible if demand warranted it. But guitarists who rely on standard footswitch, knob, and expression pedal operation with be in heaven with the Vintage Modified Superdelay. The Vintage Modified Superdelay is a gem of a delay pedal. Let’s see the final result. The Empress Effects Vintage Modified Superdelay is one of the most original and versatile takes on a digital delay pedal that provides cutting edge and classic delay tones. While there are several high-quality multi-mode delay pedals out there, none of them sound and feel quite like the Vintage Modified Superdelay. The delays all sound stellar, and even though the Tape Mode may be the focus for some, there isn’t a bad delay tone to be found in this pedal. This will be the end-all delay pedal for some, perhaps even knocking some of your delays off your pedalboard. If you’re looking for the best digital delay pedal, the Vintage Modified Superdelay is a must-play. 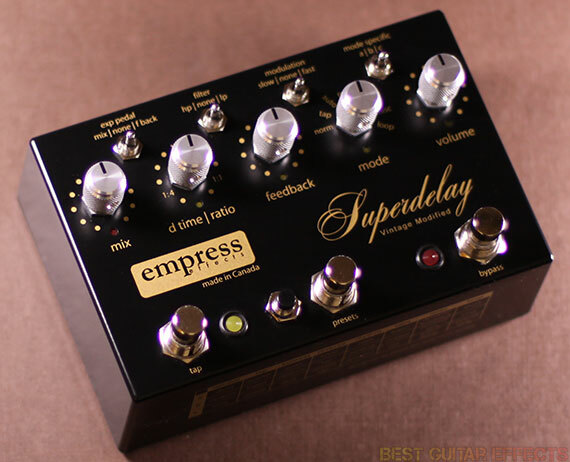 Want to buy the Empress Effects Vintage Modified Superdelay?